Title: Shakespeare portrays contrasting glimpses of Lord Capulet in his play Romeo and Juliet. Examine Capulet’s behaviour in a range of scenes; say what you learn about his personality and how you feel about this character. The play, Romeo and Juliet was set in Verona, north of Italy. Juliet’s father Lord Capulet and his family are still active in an old feud with the Montague family, from which Romeo was born. At the Capulet’s banquet, Romeo dwells in frantic fondness at the sight of Juliet – the daughter of his father’s archenemy. Despite this, he proceeds to pursue a relationship with her. However, Lord Capulet is intent on Juliet marrying Count Paris, her suitor. Shakespeare’s development of the character Capulet involves the brief exploration of his behaviour in various settings and situations. Each time his character is encountered, it is mainly short-lived - in snapshots. These reveal different aspects of his personality to the audience and act as pieces of a jigsaw. From these, I was able to develop an understanding of Capulet’s persona in its entirety. A fight between the servants and young men in the opposing households had been gathering crowds. With very great haste and without due deliberation Capulet joined in, displaying what could already be judged as a violent tendency. The quotation above shows Lady Capulet’s reaction. Aware of the implications, she attempts to restrain her husband but to no avail; his dominant role already being established in that her opinion is immediately discarded. This is dove-tailed with Act 3 Scene 5 when Lady Capulet and the nurse are permitted no say in the way Capulet chose to discipline his daughter, whose words were also ignored. He was outraged at the fact that Juliet defied his decision that she and Paris be wed.
Paris’ commitment to being with Juliet would ensure there was someone there at all times to bring comfort and happiness to her in light of recent events. From this, we know that Capulet’s reasoning behind his decision mirrored his good intentions - the fact that he wanted the best for his daughter. Through marriage, he felt that Juliet could recover and deal with her bereavement at more ease. This accounts for Capulet’s rhetorical questions quoted above. His reference to her in the third person as ‘she’, indicates how he belittles her. He can’t imagine why Juliet would even consider going against his will. He expects her to be thankful for his efforts and more importantly, “proud” to be engaged to such a wealthy, recognised earl. Capulet does not in the slightest consider that his daughter may not, like him, give wealth and status such high importance when looking for a husband. We see that though he wants what’s best for his daughter (as would any father), he possesses the inability to empathise and listen to anything Juliet has to say. We can imagine that children like Juliet were not envisaged on the whole during that time. Instead, they were judged incompetent of understanding certain issues surrounding them, and were therefore given little or no input in decision-making. Unbeknown to her parents, Juliet had already married Romeo and therefore could not marry again unless Romeo died. She would not and could not be with another man other than her beloved Romeo. The fact that Juliet did not inform her parents of her marriage to Romeo shows that communication in their family was limited – evermore distancing their relationship. In they eyes of her family, Juliet was still grief-stricken over her cousin Tybalt’s murder. Her tears however, were only for Romeo who had been sentenced to banishment for committing the crime in defence of his own life. Here, Capulet makes a thoughtful attempt to understand his daughter’s distress by describing how he imagines her to be feeling. He describes her metaphorically: her mournful sighs being “the winds”, her tears: the heavy downpour of rain and her eyes: the flowing “sea” . These metaphors illustrate the intensity of Juliet’s feelings by appealing to our sense of hearing and touch. The fact that weather can be heard and felt physically increases the dynamics of the imagery – we can almost feel her pain. However, Capulet’s sympathetic mood changes drastically when he learns that Juliet does not wish to marry Paris. His calm, thoughtful demeanour turns upside-down almost instantaneously.Unable to comprehend Juliet’s opposition, he launches into an undignified tirade of insults.Typical of anyone in their fury, Capulet bears no thought to the consequences of his forceful utterance. “green-sickness carrion” – This was said in reference to her physical appearance which resembled an anaemic lifeless corpse. Juliet had drained herself both physically and emotionally over thoughts of Romeo and being parted from him. Her face was pale like wax (‘tallow’). However, Capulet’s deplorable tongue-lashing did not end there. Instead, he threatened to drag her by her hair to the church. Capulet talks about a “hurdle”: a wooden frame on which traitors were dragged through the streets to execution. He explains that he’d drag Juliet to the church even if it looked like she was being taken to her death. In this instance, Capulet returns to his initial unconcern for the thoughts and judgments of others. What mattered most was that his decision was not dishonored. Through these lines, Capulet’s fury is manifested in our imagination. – the audience can visualize him cold-heartedly and forcefully dragging her to the Church. His aggressive performance is confirmation of the violent tendencies he has, first recognised in Act 1 scene 1. Prior to this, Lady Capulet intervened and undermined his behaviour, specifically his treatment of their daughter. She questioned his sanity, referring to him as being ‘mad’ – a term that I believe to have been taken for it’s literal meaning: having a disorder of the mind; insane, as opposed to it’s lighter usage seen today. The fact that she is on her knees demonstrates her inferiority to the audience. Though her father is clearly in the wrong, Juliet remains polite, addressing him by saying “Good father”. Notwithstanding her subordination, he responds showing no mercy. He expresses a want to strike her and orders her to silence her tongue. If she didn’t respect his wishes, she would be disowned. The word ‘graze’ alludes to the animal imagery created here by Shakespeare. Capulet demoralizes his own daughter by implying that her dishonour was such that she was unworthy of human description. “ God in heaven bless her! Lord Capulet’s tone is sarcastic, calling her “my Lady wisdom”. He also calls her a gossipmonger, saying she should save her words for “gossips”. This demonstrates how quickly Lord Capulet placed judgements on others, not looking first at his own flaws. Condescending in his words to the Nurse in Juliet’s presence, he showed disrespect: setting a bad example, as he was one who constantly demanded respect. He was also being ungrateful, forgetting how much the Nurse had contributed to the well being of his daughter. However, it was easy for him to be in outrage at what he felt was his daughter’s ingratitude. During this heated outburst at Juliet, Capulet, true to his nature had the last word on everything. This was also shown in Act 1 Scene 5 at the Banquet hosted by Capulet. When his nephew Tybalt noticed that Romeo was at their party, he threatens that he could kill him. Tybalt’s words, whether they were meant literally or figuratively, mirror the influence Capulet had on his family. At this point, a feeling of suspense and tension is increased in the audience, adding to the dramatic effect of the play. Tybalt feels that there is nothing stopping him from killing Romeo as they are all villainous rogues and the audience realise this. This is a key moment in the play and though they do not know it yet, Capulet is the only one who can save him.Tybalt’s reaction to Romeo’s presence shows the animosity he feels towards Romeo even though the cause of their bitter conflict had long been forgotten. This alone enables us to understand the impact of Capulet’s dictatorship on his family.He stated that Montague was a foe and he became such without a just vindication to his claim. Once again, the audience are suspended, anxiously awaiting Capulet’s reaction to what Tybalt will tell him. When Capulet learned of the Montague’s presence, he unexpectedly welcomed him to remain in his house as a guest. He went as far as extending him many a compliment, praising his good reputation and referring to him as a ‘gentleman’. The effect of this is that the audience’s tension was relieved. Capulet’s personification of Verona, effectively establishes his warm and inviting spirit. He doesn’t want Romeo to feel like an outcast at the masquerade. Knowing that the people of Verona appreciate his admirable nature, Romeo will feel less tense partying with them. The response here from Capulet contradicts his initial outrage at the very sight of a Montague. This complete contrast indicates the fact that Capulet has an unstable persona. As we know him to do, Capulet speaks to his nephew with assertiveness and again, ensures that he has his way. The quote above shows how Tybalt argues with him a little, insisting that this “villain” was not treated with courtesy. However, referring back to my previous point, Capulet is granted the silence he demanded from his nephew. Capulet’s use of the word ‘shall’ demonstrates his assertiveness and how authoritative he is – he is forceful in establishing order within his hom, as “master”. This moment in the scene adds to the play’s dramatic effect. In this moment, Lord Capulet reaffirms his position of authority amongst his family by making a fool out of Tybalt who is known for his strength and ability to fight. ("More than Prince of Cats… a duelist, a duelist!”) Though the party continues in its merry ways, the confrontation between Lord Capulet and Tybalt’s foreshadow the tragedies to come – the audience become weary of danger. He has a good sense of humour, joking with his guests. This exciting and more fun filled insight into Capulet shows that he genuinely knows how to have fun and can be an enjoyable person to be around. In the knowledge that no one would dishonour him in his household, he rhetorically asks his guests if they’d refuse to dance. In an attempt to loosen the tensions of those shying away from the dance floor, he says that anyone who makes a fuss (“makes dainty”) is unable to dance because they have corns. We begin to realise however, that this change in attitude revolves around his guests - his comical attitude is more of a pretentious act. We learn how important his status is to him and he cares to maintain it well. As explained earlier, Capulet made sure to avoid a scene concerning Romeo’s presence at his banquet, to protect his reputation. This (above) was said to Tybalt. Capulet’s first thought was to prevent “a mutiny”, a rebellion amongst his guests against his authority. He mentions his “soul”, implying that his want to sustain his reputation had a deeper significance – it was a part of who he was and had become. This is confirmed by his remarks, in reaction to the ‘death’ of his daughter. Again he talks of his soul and thinks only of himself. In this line, Capulet’s selfishness and desire to satisfy himself is demonstrated. He mourns not for his daughter but for what he has lost. Capulet seems consumed by the fact that his plans for Juliet’s big wedding to a wealthy earl can no longer be a reality. We now have an explanation for his sudden haste to marry Juliet off. He would not listen to anything Juliet had to say during the argument because he was more concerned that she had the all-out big wedding he wanted for her and Count Paris. Though it is not stated, we can imagine from this that a wedding was much more of a status-building event. Juliet could make her debut as the beautiful daughter of Lord Capulet, who would proudly show her off and have her grand wedding be the talk of Verona. Thus boosting Capulet’s image. The reasoning behind the rash decision for Juliet to be wed was yet again to fulfil Capulet’s desires. He had previously shown his care for Juliet by protecting her and being practical about Paris’ suit. He insisted that those who marry too soon are spoilt too soon. Here, he clarifies the fact that his intentions are only to play a part in influencing her choice. He accepts that she will make the final decision on her own accord. In fear of losing Paris’ interest in his daughter, Capulet goes against his previous words of wisdom, sensibility and makes the rash decision for marriage in confidence of Juliet’s approval. Capulet’s pride is made apparent once again through his words. He comment’s that “she will be rul’d” and in respect to her father Juliet would agree to the marriage. The certainty in his words only strengthens what we already know of Capulet’s pride in himself. I believe however, that what Capulet expressed to Paris before hand concerning their marriage, was genuinely heart-felt. However, his overwhelming desires to uplift his status took over. Throughout the play, Lord Capulet’s personality was colourful and unstable. Though he seemed very mature and in control at times (at the banquet with Tybalt and when talking initially with Paris about Juliet), a teen-like mentality came screaming out when something went against his will. I’ve learnt that Capulet’s childish outbursts and violent tendencies derived from a deeper source – the fact that he was not contented with himself – there was a void within him. It seems that during Capulet’s time, lives were plagued with suppression and restriction. People had no opportunity to express themselves and consequently, were unable to recognise and understand their individualism. As a result, people hid behind masks – their role in society. They learned to accept the roles they played. We saw that during moments of disagreement, the inferior person always yielded to their superior, regardless of if they agreed or not: Lady Capulet, the Nurse, Tybalt and Juliet to Lord Capulet, and Lord Capulet to Prince Escales. In the case of Capulet, his mask was his ‘master’ role and high social standing. As most of his life was spent concentrating on a family feud, the cause of which was unknown, he lost track of who he was inside. Unable to gain true happiness through simply being himself, he made many attempts to fill the emptiness he felt inside. His position in society was what he knew all too well and therefore, he sheltered behind it, basing his actions on advancing on the status ladder. Feeling incomplete, he fed his emptiness on personal moments of victory: joining the fight against the Montague’s outside his house and ensuring he always had his own way. I felt that being an older man, a more dignified behaviour would have been more appropriate. The play clarifies that Lord Capulet believed strongly in his masculine logic and fatherly provision. He had little understanding or relationship with those surrounding him. He could not reach out to anyone from an unstable base - it was like reaching for a book on a shelf when standing on a chair with wheels. This explains the misunderstanding and difficulty in relationship he and the other characters had: Juliet, Lady Capulet, the Nurse and more central to the issue, Old Montague. Capulet’s impulsive words sprung a negative effect on Tybalt when he was told to leave Romeo alone. He becomes stubborn and vengeful and disloyal to Lord Capulet. As head of the family, Lord Capulet was largely responsible for everything that went on, and despite his closed-mindedness he was still a pretty admirable man. It was evident that he was a good father who only wanted the best for his daughter. However, not enough thought went into Juliet’s feelings. He didn’t realize that marrying Romeo was what was best for Juliet. Being with him would allow her heart full of love and personality flourish as opposed to being suppressed, like his. Moreover, it was what she truly wanted; yet, he didn’t take the time to hear what she had to say. Her happiness should have been put before his own. Instead he played a major part in the death of Juliet by forcing her to marry Paris, separating her from Romeo, and rejecting her own decisions without consideration. Until he gets fully rid of his baggage “the feud”, which weighs him down, he won’t be able to move on and be the sensible fun loving father we saw creep out now and again. Lord Capulet needs to accept himself for who he is and not what he is. Romeo and Juliet - How does Shakespeare present the character of Lady Capulet? 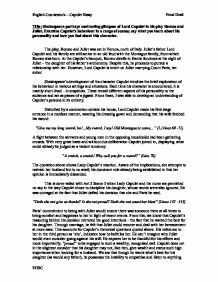 How does the character of Capulet change during the play? 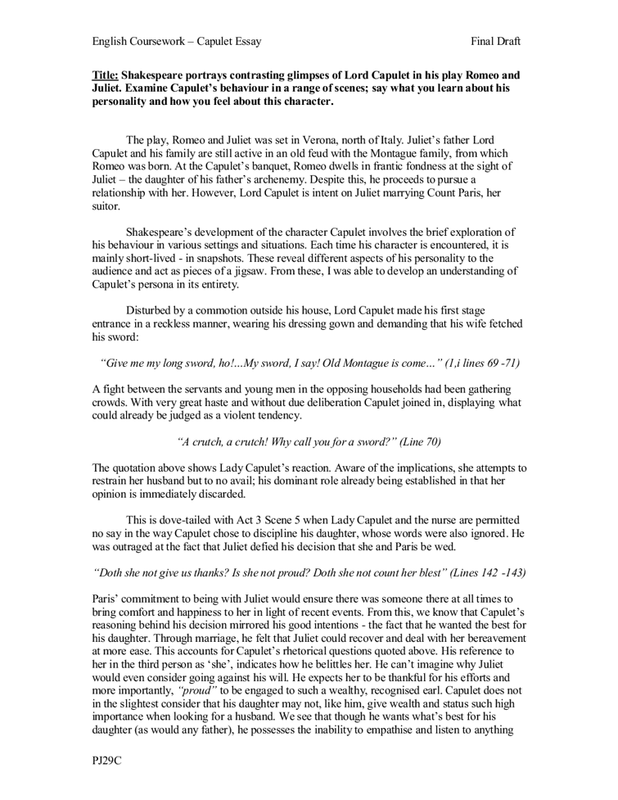 Romeo and Juliet - Are Lord and Lady Capulet good parents? He is also a "people pleaser" and he likes it when he is control as it shows his power and status to others. This is the creation of Lord Capulet's character shown by Shakespeare as he brings the character to life. (P177, Lines 72/3.) Juliet's mother tells her that her father has arranged for her to be married to Paris; she says he is "careful"; Capulet accepting Paris' offer, despite his previous comments ("and too soon married") shows how he is concerned and compassionate for Juliet. He is welcoming his guests and talking like a gentleman, but is also making jokes, 'welcome gentleman, ladies that have their toes / Unplagu'd with corns'. He is trying to behave like a good host to give his family a good reputation. Why call you for a sword?" The fight ends when the Prince sets his decree. In Act 1 Scene 2, you see Lord Capulet's reaction to this decree; "-'tis not hard, I think, /For men so old as we to keep the peace." This shows that Capulet can be wise and mature however I believe that he usually decides to listen to his more aggressive side. She is show to be manipulative with her parents, in a part of the scene where she talks about Romeo. 'O how my heart abhors To hear him named and cannot come to him, To wreak the love I bore my cousin' Lines 99-101. Although, Lady Capulet may just be hiding her feelings towards Tybalt. After Juliet's reaction Lady Capulet replies by telling Juliet to stop grieving. "But much of grief shows still some want of wit." Shakespeare shows again that Lady Capulet has a lack of compassion and that she has the views of a male in this era through this line.